Websites are an important marketing tool to attract more customers to your products and services. To attract the customers, you want the website to be engaging with unique designs that grab the user’s attention. You also want it to be user-friendly with the layout being clear and concise. Without a website, you’ll miss out on more than half of your potential customer base. Call South Coast Web on 01202 665855 to start your website journey today! To have a successful business, you need it to be professional and generate enough sales throughout the year. This is where websites come in. A website’s job is to drum up some business for you through the internet. Did you know that over 50% of people prefer to do their shopping online? And again, over 50% of internet users browse the web through their mobile phone over a desktop. This is a lot of people that you want to reach as you don’t want to miss their potential business. This is where our fantastic design services come into play. Our designers can provide you with bespoke first-class web design in Weymouth and beyond. To get the most out of your website, we need to know everything about your business and what you want to achieve from it. Whether it is over the phone, through a face to face meeting at our office or in a location that is convenient to you, our teams will take the time understanding your business, your aims, and everything you would like it to achieve from it. Through this understanding, we design a website that is tailored to your tastes, your business and the type of designs that would appeal to your targeted audience. 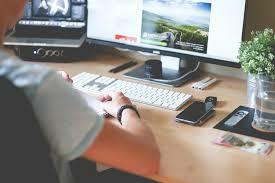 Now you have received the best web design Weymouth and the UK have to offer, you have the perfect website to be released into the world wide web. With this creation, you’re ready for the next steps of creating a large online presence; SEO. Our web design skills have ensured that your website has all the right tools to be SEO friendly, this is short for search engine optimisation. Search engine optimisation is the process of getting a website seen within Google. What this means is your website will not automatically appear unless people type the name of your company into the search engine but unless they know you exist from other marketing methods, this won’t generate much traffic to your website. So, you need to find a way for your website to appear in Google organically. This is through your website coming up as a search result for a query that is typed in through the search engine. This query is essentially typing in a few keywords such as ‘web design company near me or ‘web design Weymouth’ and Google will give websites as results that are relevant to those keywords. But how can you get your website to appear for these keywords? This is where our SEO specialists will come in. Therefore, you need a web designer in Weymouth that knows about SEO and creates your website with ranking in mind. Here at South Coast Web, our web designers in addition to our SEO department can create you an online presence. Now you know how great your business could be with the right online presence, you need a web design company that can provide web design for Weymouth. Here at South Coast Web, we are very close to Weymouth, therefore, we are easily accessible to you or we can even come to you; simply give us a call on 01202 665855.